This is a comprehensive history of English literature written in Britain between the Reformation and the Restoration. While it focuses on England, literary effort in Scotland and Ireland is also covered, with occasional references to Wales and Ireland. This literary history by an international team of scholars is essential reading for students and scholars of sixteenth- and seventeenth-century English literature, culture, and history. Introduction David Loewenstein and Janel Mueller; Part I. Modes and Means of Literary Production, Circulation, and Reception: 1. Literacy, society, and education Kenneth Charlton and Margaret Spufford; 2. Manuscript transmission and circulation Harold Love and Arthur F. Marotti; 3. Print, literary culture, and the book trade David Scott Kastan; 4. Literary patronage Graham Parry; 5. Languages of early modern literature in Britain Paula Blank; 6. Habits of reading and the creation of early modern literary culture Steven N. Zwicker; Part II. The Tudor Era from the Reformation to Elizabeth I: 7. Literature and national identity David Loades; 8. Literature and the court William A. Sessions; 9. Literature and the church Janel Mueller; Part III. The Era of Elizabeth and James VI: 10. Eliza's England, whose Scotland, whose Ireland? Claire McEachern; 11. Literature and the court Catherine Bates; 12. Indoctrination, edification, and polemic: literature and the church Patrick Collinson; 13. Literature and the metropolis Lawrence Manley; 14. Literature and the theater David Bevington; Part IV. The Earlier Stuart Era: 15. An emergent Britain? : literature and national identity Johann P. Sommerville; 16. Literature and the court Leah S. Marcus; 17. Literature and the church Debora Shuger; 18. Civic continuities and revolutionary beginnings: literature and London Thomas N. Corns; 19. The emergence of a metropolitan drama: literature and the theater to 1660 Martin Butler; 20. Literature and the household Barbara K. Lewalski; Part V. The Civil War and Commonwealth Era: 21. Literature and national identity in England Derek Hirst; 22. Literature and religion David Loewenstein and John Morrill; 23. Civil war and the new literary scene: literature and London Nigel Smith; 24. Literature and the household Helen Wilcox; 25. Alternative sites for literature: rural, convivial, and intellectual domains Joshua Scodel; 26. From revolution to restoration in English literary culture James Grantham Turner; Chronological outline of historical events and texts in Britain, 1528–1674, with list of selected manuscripts; Select bibliography (primary and secondary sources); Index. "For advanced researchers in the field...this book certainly provides an overview of the current state of literary scholarship in early modern English literature." "This book is a major accomplishment, and will alter the very landscape for which it provides such an effective map." 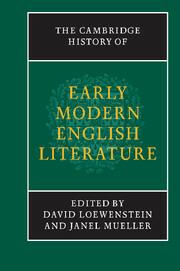 "Astonishingly comprehensive and coherently unified [...]This extraordinarily useful reference work [is] at once authoritative, pioneering and inclusive..."
"The Cambridge History of Early Modern English Literature offers riches beyond the wildest dreams of avarice, too many to be counted or told here. Others will find different glimmers of gold." "The book provides a valuable synopsis of recent scholarship by a selection of leading scholars. Students will find short, readable, reliable accounts in this landmark volume. The whole set will be necessary for all academic and large public libraries. Essential." "Addresses religious, political, and ethnic discourses and their relation to elite, confessional, and national identities in fairly straightforward terms. Ultimately, one garners a good sense of the state of play on these issues and many of the relevant principal texts from the chosen period." "[T]his is a book that all serious libraries will want and need to own; it is a book of which its editors, contributors and publisher can all be proud." "Cambridge History of Early Modern English Literature will likely exert substantial influence on the study of the period."